April 2nd is Equal Pay Day, a reminder that there is still a significant pay gap between men and women in our country. The date represents how far into 2019 women would have to work to be paid the same amount that men were paid in 2018. On average in 2018, women were paid 22.6 percent less than men, after controlling for race and ethnicity, education, age, and geographic division. Even after extensive research has been done to show the gender pay gap exists (and persists), some skeptics refuse to believe the data. 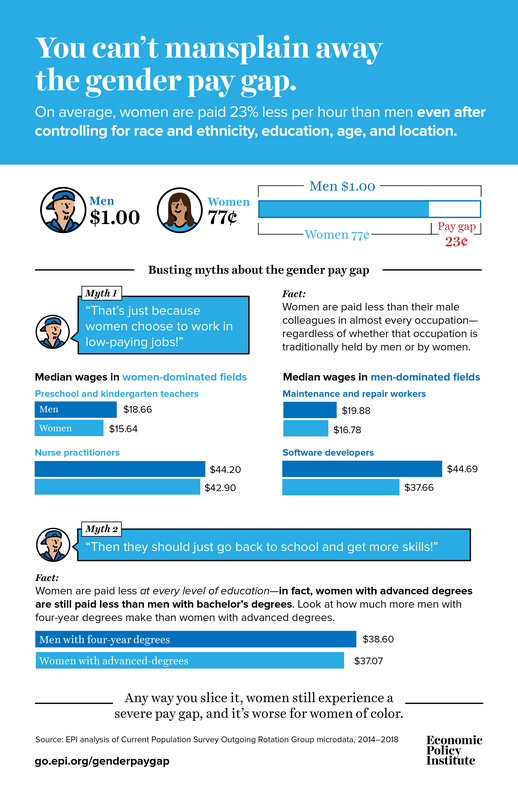 This infographic shows some of the most common criticisms of the gender wage gap and rebuts the “mansplainers” with data. It’s not so easy to explain away the existence of the gender pay gap. It remains after controlling for relevant factors, showing up in nearly every occupation—whether it’s dominated by men or women—and across all levels of education. It bears repeating that women with advanced degree are paid less, on average, than men with bachelor’s degrees. Furthermore, if the overall 22.6 percent gender pay penalty isn’t cause enough for alarm, the gaps for black and Hispanic women are even larger. Compared to white men, black and Hispanic women are paid 34.9 percent and 34.3 percent less, respectively, after controlling for age, education, and geographic division. There is no silver bullet to solving pay equity, but rather a menu of policy options. My colleague Margaret Poydock and I recently extolled the benefits of the Paycheck Fairness Act, passed last week by the House of Representatives, but there are more policies that can close not only the gender pay gap but also gaps by race and ethnicity. These include: requiring federal reporting of pay by gender, race and ethnicity; prohibiting employers from asking about pay history; and adequately staffing and funding the Equal Employment and Opportunity Commission and other agencies charged with enforcement. To close the gender pay gap, women need to see real wage growth faster than their male counterparts. As it turns out there’s plenty of room in the economy for the pay gap to narrow while both women and men see real annual wage growth. Policies that can lift wages for most workers while also reducing the gender pay gap include running the economy at full employment, raising the federal minimum wage, expanding eligibility for overtime pay, and protecting and strengthening worker’s rights to bargain collectively for higher wages and benefits. For more policies that will raise wages, see EPI’s Policy Agenda.